There are 2 ferry routes operating between Canada and Nova Scotia offering you combined total of 77 sailings per week. Northumberland Ferries operates 1 route, Wood Islands to Caribou which runs 9 times daily. Bay Ferries operates 1 route, St John (New Brunswick) to Digby which runs 14 times weekly. As the frequency and duration of crossings on some routes varies we would advise that you do a live search for crossings from Canada to Nova Scotia to get the most up to date information. Canada is the second largest country in the world by total area, bordering the United States to the south. Not only is Canada blessed with one of the most breathtaking natural landscapes in the world, it brings a diverse culture and a variety of vibrant cities to the table as well. It’s a haven for any kind of traveller; you can spot orcas along the west coast, ski down Whistler Mountain, explore Colonial landmarks or sample some exquisite French cuisine in a buzzing metropolis. With the British Columbian shoreline stretching over 25,000 km and the islands of Graham and Victoria found just off the coast, there are plenty of ferry departure points to choose from. There are numerous routes available too, both international and domestic, all operated by top quality ferry companies. 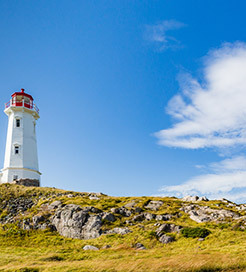 Nova Scotia is the second smallest, yet second most-densely populated province in Canada, comprising a peninsula and many offshore islands on the nation’s east coast. Green and rugged hills speckled with farms and fringed by high sea cliffs make up the majority of natural Nova Scotian backdrops, whilst the countless harbours are lined by fishing boats and charming houses. So it’s easy to see why over a hundred Canadian film productions are held here each year. The capital, Halifax, is one of the most historic cities in North America. Home to the oldest lighthouse on the continent, it also boasts fascinating sites from the American Revolution and once saw the greatest artificial explosion in the world, before Hiroshima, when two battleships collided during the First World War. Moreover, it’s consistently ranked as one of the best Canadian cities for quality of life and business friendliness. Nova Scotia is well connected by ferry, with regular crossings from Canadian cities across the Bay of Fundy and the Northumberland Strait. There are also frequent international ferry routes from the United States.